Former Posh goalkeeper Luke McGee should be in the Pompey starting line-up at the ABAX Stadium. Peterborough United manager Grant McCann fears he won’t be able to strengthen his squad in the January transfer window if his team are cut adrift from the League One promotion pack. Three wins in the last 13 League One matches has seen Posh slip down the table to 11th ahead of tomorrow’s home match with Portsmouth (November 21). Posh midfielder Gwion Edwards should start againt Portsmouth. 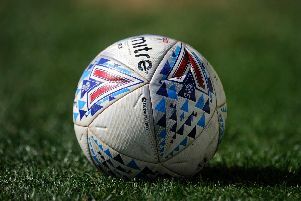 McCann’s men remain just three points outside the play-off zone and have a game in hand on most teams above them, but an instant improvement in form is a necessity following Saturday’s (November 18) 1-0 defeat at the hands of Blackpool at the ABAX Stadium. “I wouldn’t dare ask for any money from the chairman right now,” McCann admitted. “We need to make sure we are in a good position come January. If we are then maybe I can ask for X, Y and Z. “Knowing the chairman if we need to strengthen the team then we will, but only if we are in a good place. “Lately we have been putting so much pressure on ourselves every game has become massive, but it’s a long season and it’s important everyone stays with us. Former Posh player Christian Burgess is now with Portsmouth. “We will turn it around. I’m sure of that and it needs to start against Portsmouth. “It’s important we put in a performance tomorrow, if only to make up for Saturday’s disappointment, but it’s most important we win. “It should be a good night of football. There will be dew on the ground so the ball will zip around a bit quicker and we are playing a very good side who are around us in the league table. “Portsmouth have a striker (Brett Pitman) in top form and we will need to watch him, but then they will have to watch Jack Marriott very closely also. “They are a big club, a bit of a sleeping giant really. They get close to 20,000 at home games, but for now they are in League One like us so we have nothing to fear. Posh have no fresh injury worries and it’s likely attacking midfielder Gwion Edwards will start tomorrow’s match after surprisingly starting the Blackpool game on the substitutes’ bench. Conor O’Malley is expected to retain his place in goal ahead of Jonathan Bond. Former Posh players Luke McGee and Christian Burgess are expected to start for Pompey.